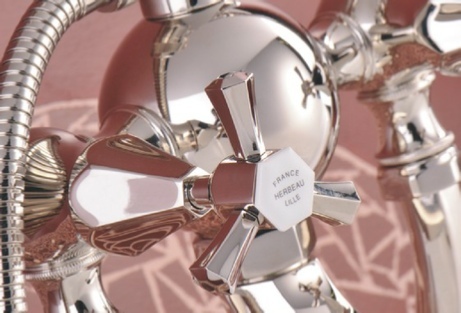 The Monarque Collection showcases the meticulous craftsmanship and striking design characteristic of French Art Deco. A rectangular faucet with hexagonal cross handles is set in a ziggurat-shaped washbasin. Sleek rectangular legs accented by white ceramic insets echo the geometric theme, while the washstand’s raised hexagonal feet provide another retro-inspired touch. As the sounds of ‘le hot jazz’ drifted through 1920’s Paris, a new era of modernism began taking place in the decorative arts. The octagon-shape of the cross handles and spout reflect changing times. 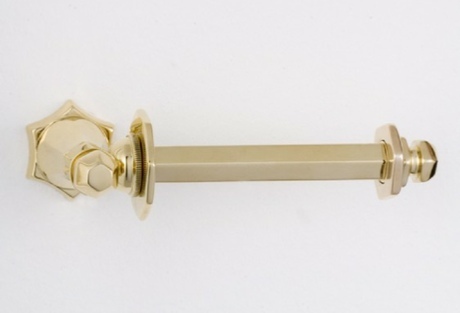 Available in fourteen finishes. 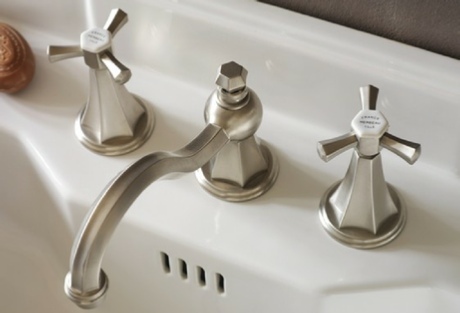 Shown in Brushed Nickel (57). 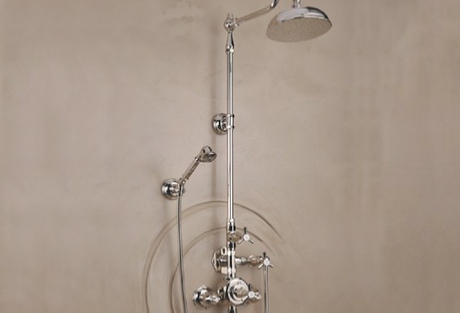 Create the look of a luxurious French Art Deco bathroom with the historically authentic Monarque tub and shower mixer. For true Retro glamour, the mixer can also be used in a free-standing tub installation with adduction pipes. This shower delivers precise volume and temperature control while also saving water. motif adds an element of spatial harmony that feels modern and sophisticated in today’s bathrooms. Inspired by the French Art Deco movement of the 1920’s, this finely wrought metal tissue holder is available in fourteen finishes. Shown in Polished Brass (55).